Urban Wood - Dapwood Furniture Co. Wherever there is a town, city or municipality, there is almost always a coordinated effort to create green spaces- especially with trees. 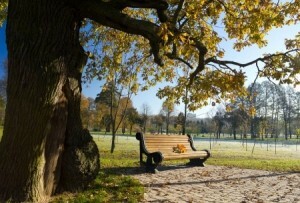 This is often done to make neighborhoods more beautiful or provide a shady spot to relax in a park. As a added benefit, trees help reduce air pollution and moderate temperatures in our ever increasing concrete jungles. The trees in this “urban forest” are usually well maintained and spaced so competition with the next tree for sunlight is negligible. Even though these trees are pampered, over time they become old and may be attacked by insects or disease. Or these trees topple over in storms or need to be removed for human development. For whatever the reason, these wonderful trees are more often than not, cut down, chopped up and sent to the landfill or burned in fireplaces. A sad end to the estimated 2,000 to 3,000 trees per year in a modestly sized city. Luckily, there are now people who salvage these under-appreciated trees and turn them into a great building material. They have turned “waste management” into “resource management” and is referred to as urban wood. What makes Urban Wood different? Urban wood has more unique qualities like knots, burls, insect holes and, even at times, pellets from air guns. This makes it highly desirable as character wood. When a log is cut into thick slabs that leave the bark edge in place this is especially true. Leaving the natural edge of a log is called a “live edge” and is prized in high end furniture, bar tops and fireplace mantle pieces. Every piece of urban wood is different and is selected to show off its inner beauty. 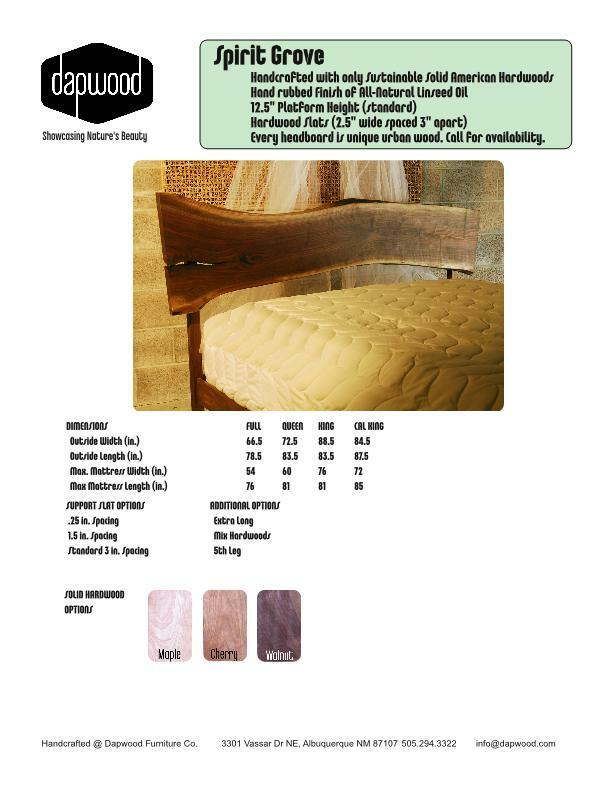 We want to get this wonderful resource in our homes so we are offering the Spirit Grove platform bed frame. 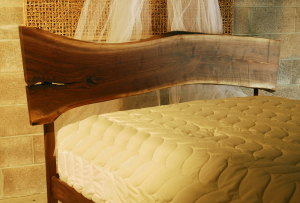 This bed features a thick live edge headboard slab that is mounted in front of the legs so it is displayed in its full splendor. The type of wood available depends on what has been dried in the kiln recently as most of these slabs are sold quickly. Dapwood is also using wide live edge pieces for dining tables and sit-stand desks. Please contact Dapwood if interested in any of these designs or have other urban wood ideas.